A formula for boiling eggs? Former colleagues of mine at the University of Oslo have made a nice flash animation to do calculations with Barham’s formula if you’re not too keen to dig out your calculator. 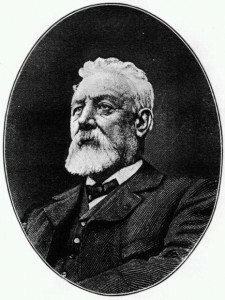 Barham states that his formula gives the time for the centre of the yolk to reach the temperature Tyolk whereas Williams mention in the derivation of the formula that it calculates the time for the yolk-white boundary to reach Tyolk. I’m not able to tell whether the formulas actually differ in this respect or not (comments are welcome on this issue!). 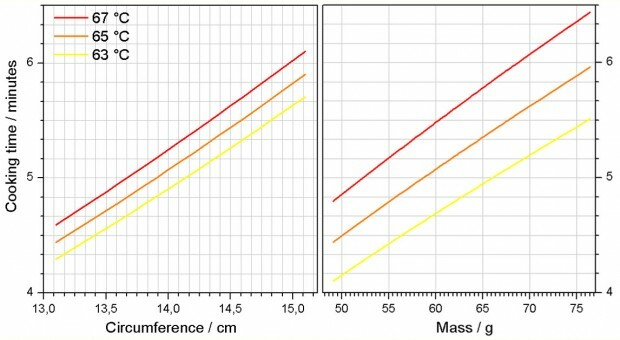 A comparison of the two formulas for a set of 50 eggs which I weighed and measured shows that for Tyolk = 63 °C and Twater = 100 °C they are quite similar, except for the larger spread of the circumference measurements (see plot below). For higher Tyolk or lower Twater Williams’ formula consistently gives longer cooking times than Barham’s formula. It remains to be seen which of the formulas will be closer to the truth. 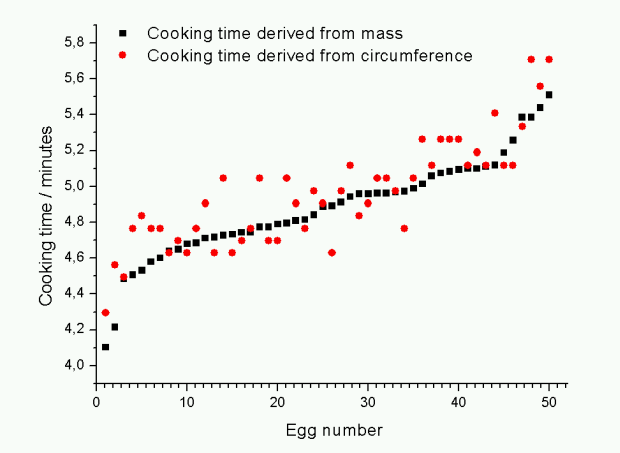 The graph shows the cooking time for 50 eggs (sorted by increasing mass) calculated from the mass and circumference using the two formulas shown above with Tyolk = 63 °C, Twater = 100 °C and Tegg = 4 °C. For the given conditions the two formulas give similar results. The most striking lesson learnt is that measuring the circumference is in fact not very accurate, hence the larger spread of these points. At sea level, the temperature of boiling water is 100 °C. At higher altitudes, the boiling is lowered. As a rule of thumb, the boiling temperature of water is lowered 0.3 °C for each additional 100 m above sea level. For an accurate calculation, check out his calculator. As we shall see later, the formula can of course also be used prepare eggs at sea level, using water kept at temperatures less than 100 °C. Lastly we must know the starting temperature of the egg which will typically be 4 or 20 °C. Based on Twater = 100 °C, Tegg = 4 °C and Tyolk = 63-67 °C I’ve prepared plots for the range of 50 eggs used in the previous graph. 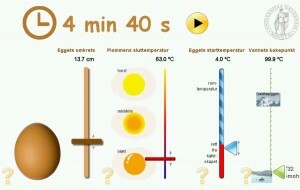 If the circumference or mass of an egg is known, the boiling time in minutes can easily be determined from the graphs. I’ve also prepared downloadable pdfs with the circumference and mass plots. But is this the perfect egg? No actually not… keep reading! The problem with using boiling water is that while you do heat the yolk to the desired temperature, you have virtually no control with the temperature of the white. If your water holds 95-100 °C, so will the white (or at least the outer most part of the white). This gives it a firm, rubbery texture. So the problem is, to put it differently, that we want to heat the yolk to somewhere above 65 °C, but we do not want to heat the white above 80 °C. The solution to this problem is to “boil” the egg at a temperature lower than 100 °C, which means not to boil it at all but rather sous vide it! Eggs are perfect for sous vide because you can just drop them into the water bath as they are. No plastic bags or vacuum packaging are required. 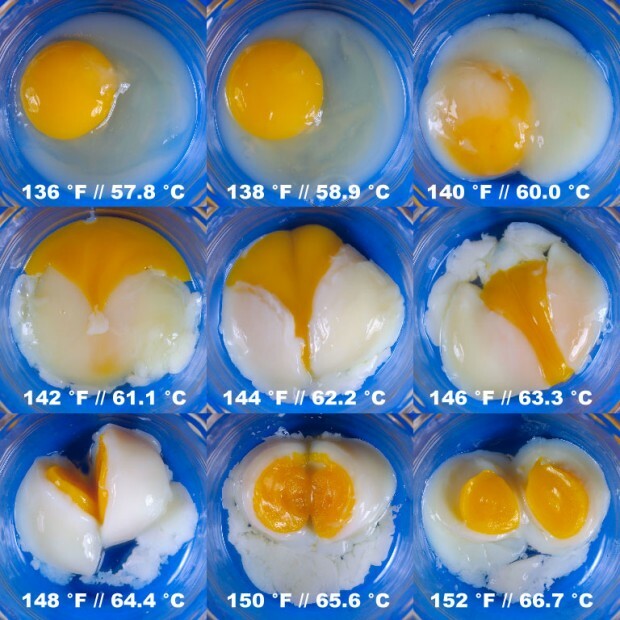 Douglas Baldwin has cooked eggs sous vide for 75 min at different temperatures ranging from 57.8 to 66.7 °C as shown below. Notice how the egg whites and egg yolks change at the different temperatures. The surprising thing with some of the sous vide eggs is that they are inverted (or opposite boiled). The white is still runny while the yolk is set. If you would like to try this but don’t have a thermostated water bath for sous vide you can improvise a little. The thermostat most people do have in their kitchen is the baking oven (at least those with electric stoves). Preheat your oven to 70 °C. Then heat 1 L of water to 65-70 °C, put the eggs in, cover with a lid and leave the pan in the oven for one hour. The tricky thing here is that oven thermometers are notoriously wrong so use a separate handheld thermometer to check your oven. With some trial and error you should be able to obtain an inverted egg with a runny white and a yolk that has set. Although scientifically amusing the inverted egg isn’t really desirable form a culinary viewpoint – the white is a little to runny. Regrettably the formulas presented above aren’t of much help either. They fail because they only take time and not temperature into account. The perfect soft boiled egg in my opinion would have an egg white which is heated to around 70-80 °C and a yolk with temperatures ranging from 64 °C at the yolk-white boundary to about 60 °C in the center. I guess it would be possible to prepare such eggs in a sous vide water bath held at 75-80 °C in less than an hour. A further complication of cooking eggs in real life is that they continue to cook when removed from the hot water. Normally this is alleviated by shocking the eggs in cold water, but if cooked at a lower temperature this could possibly be omitted. I will start experimenting to find a perfect mass-time-temperature combination with a time window that’s as large as possible, and I’ll report the results in a future blog post. And these experiments will also include a test of the recipe for eggs cocotte by Joí«l Robuchon, found via Chubby Hubby’s post on slow-cooking an egg. The skillet was duly set upon the stove, and Ben Zoof was prepared to wait awhile for the water to boil. Taking up the eggs, he was surprised to notice that they hardly weighed more than they would if they had been mere shells; but he was still more surprised when he saw that before the water had been two minutes over the fire it was at full boil. Servadac reflected. “It cannot be that the fire is hotter,” he said, “the peculiarity must be in the water.” And taking down a centigrade thermometer, which hung upon the wall, he plunged it into the skillet. Instead of 100 degrees, the instrument registered only 66 degrees. “Boil them hard! That will never do,” objected the orderly. There is in fact no need to head off to other planets to find examples of low temperature prepared eggs. If you go to Japan you’ll find onsen tamago which litteraly translates to “hot spring eggs”. 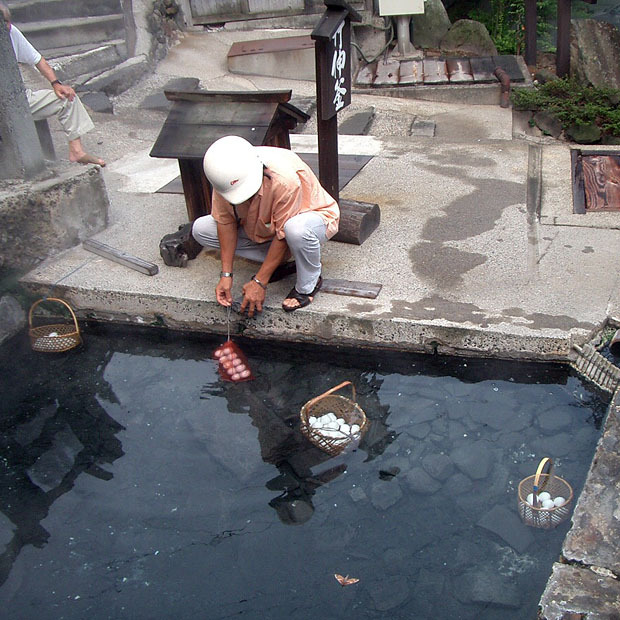 Originally baskets of eggs were lowered into hot springs, but the temperature of hot springs vary so I imagine that there were several types of onsen tamago available (does anyone happen to know the exact temperature of the hot springs used?). After cooking the egg is typically cracked into a bowl of dashi soup with mirin and soy sauce. The challenge of preparing onsen tamago eggs at home is accurate temperature control (just as with sous vide in general). One tip I found was to place the egg on top of rice that has just cooked in a rice cooker. Leave the eggs to “cook” for about one hour while the “keep warm” function of the rice cooker is turned on. I’ve been told that in Finland some saunas are equipped with egg racks. Depending on where the rack is placed one could probably chose between hard boiled and soft boiled eggs. But the sauna would have to be kept warm for a long time due to the slow heat transfer from the hot air. And talking about eggs and saunas: If the eggs are placed directly on the hot stones they will not only be hard boiled, but actually turn completely brown and acquire a nutty flavor. In Korea such sauna eggs are known as Maekbanseok gyeran. Housewives should pierce eggs before boiling them, since if they are fresh it will do no harm and if they are stale it will prevent splitting. We can safely assume that the advise holds true for men as well! Apart from piercing holes to avoid cracking it is possible to reduce the potential damage from cracking by addition of salt or vinegar to the water. This will help the egg white coagulate faster and thus plug any crack formed. 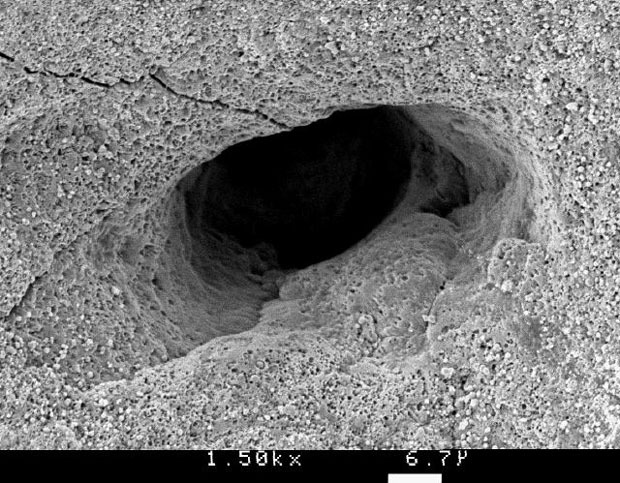 Picture of egg shell pore (Photo: Jim Ekstrom. Permission: Freeware for non-commercial use). If you’ve read this far, make sure to also read how the egg yolk problem was finally solved and my follow up post with pictures and a video of egg yolk cooked at 63.0 °C for 40 to 155 minutes! There were a lot of temperatures in this post so I found a widget for Celcius-Fahrenheit conversions. I placed it at the top of the right sidebar – hope it works. This has got to be one of the greatest food blog posts I have ever come across. Thank you so much for all the hard work and research that have gone into this. Very, very interesting! I find boiling eggs such an elusive goal–whatever stage you want it to reach. Of course I’ve been cheating–steaming them in an egg-a-muffin machine. I know. I’m such a faker. The upper temperature at onsens and other hot springs for bathing are 42°C – 49°C (108°F-120°F), at most. Any hotter and scalding would occur. This seems to be too low to effectively cook a good soft boiled egg. Though natural hot springs may bubble from the ground at any temperature, so it is possible the pools used to boil the eggs are much higher temperature. Could it be that the eggs are cooked in hotter parts of the onsens that are not used for bathing? At the temperature you mention nothing will happen to the egg. Asked a Japanese co-worker about it. You are correct in that the onsens used to make onsen tamago are not used for bathing, they are much hotter ideally around 70° give or take according to him. In Goshogake onsen, the temperature is 90° . An egg becomes black. In Ohiradai onsen which is part of Hakone, 65° . It takes 30 min to make onsen tamago. Thanks for the info on the onsen temperatures. I can imagine that the 65-70 °C you mention should be ideal. I’ve read about the black onsen eggs (kuro tamago) – quite interesting. The black color is caused by hydrogen sulfide which reacts with iron from the hot spring to form iron sulfide which is deposited on the egg shell. This reaction does not occur in the hot spring due the low pH, but occurs on the egg shell which is primarily calcium carbonate. When left in the air the iron (II) sulfide is oxidized by oxygen in the air to iron (III) oxide. The sulfur ends up as either elemental sulfur or sulfur dioxide. You may find this an interesting one to play with…. 5. Allow eggs to remain in the right side bath for a minimum of 5 minutes. 7. The eggs will remain the same upto 4 hours after placing into the 55°C bath. Olly: That’s an interesting approach for those with access to a dual chamber sous vide! I’ve tried to insert the numbers you mention (66 g egg, 90 °C water, eggs starting at room temperature and 7:30 min cooking time) into the formulas using the linked flash animation. This suggests to me that the yolk would end up well above 70 °C. Is there something I missed or does this only show that the formulas are less reliable at lower cooking temperatures? Or does the efficient cooling at 55 °C play an important role here? Yea, the drop in temperature to 55ºC is the important thing here. The eggs I used came out as perfect soft boiled eggs to eat immediately after cooking at 90ºC for 8 minutes. Ran a series of tests and got the result fairly quickly. Opening the egg after the 7:30 minutes at 90ºC resulted in a still runny egg white. Opening the egg after 8:00 minutes at 90ºC, and then holding at 55ºC for 10 minutes resulted in a thick, semi-solid yolk. Hope this makes it a little clearer, and that you get to try it for yourself…. Also, we did trials on cheap battery farmed hens eggs, and these needed upto 30 seconds less cooking time at the higher temperature. Other things that that I have found that add to variations in sous vide cooking that are hard to account for are the type of chicken, type of feed and season. All of these contribute greatly to the protein and water profile of an egg which I have found can lead to almost a degree difference in reaching the same consistancy with different sourced eggs. I find if I sous-vide eggs at 64.5C for an hour and them crack them open, the yolk is perfect but the egg white is sometimes less set than desired. Very easy resolution, a blast with the propane torch fixes this quickly and the wonderful custard egg yoke stays constant insulated by the now firmer egg white. Also Martin, the immersion circulators increment by 0.1 degress, (well the polyscience one does) why was your test increment 1.1 degree? Olly: Thank’s for all the details regarding your sous-vide eggs! This suggests that cooking of eggs takes a little longer than the formulas suggest. Robert: Interesting! I’m wondering – would a higher protein content make the egg more or less heat tolerant? johnno: Or you could just quickly dipp the egg into boiling (or near) boiling water :). Regarding the pictured sous vide eggs – this experiment was in fact done by Douglas Baldwin and he did the experiment in Fahrenheit. You write, “I will start experimenting to find a perfect mass-time-temperature combination with a time window that’s as large as possible….” Instead of the expensive sous-vide approach, would it be possible to instead do “eggs in cooling water”, akin to fish in cooling water? Then all the poor home gastronomist needs is a scale and a timer. THis was a very interesting post and made me want to run to the kitchen to start experimenting! Only problem: I”m allergic to eggs and it seems a waste to cook something you can’t eat! Today we had soft-boiled eggs for breakfast. As always, we pricked the ends of the shell with a needle so as to reduce cracking. One of the eggs tended to float when placed in the boiling water–not a good thing. This egg immediately leaked through the puncture, and over a minute or so ejected most of its contents. The yolk formed a perfect ball in the boiling water. It looked exactly like a yolk removed from inside a hardboiled egg. The egg shell, meanwhile, remained intact. The contents were ejected through the original pinhole and cracks in the shell (post-mortem, it appears that the egg was cracked to begin with and may have had trapped gasses from incipient decomposition). I am baffled by the mechanism whereby the yolk remained intact in the boiling turbulent water after being squirted through a small aperture. Any ideas? and then either comment with your explanation on how that’s done or email me back, i’d be most appreciative. What you describe and the video link is the ‘slow cooked egg’ as detailed by Douglas Baldwin above. Many restaurants have been serving this for a few years now as vegetarian dishes etc. Hope this allows you to do it yourself! I bow before your gastronomic geekery! My usual way of cooking eggs is simply to use one of those plastic-egg thermosensors (they change color from red to purple as the egg cooks), rather than timing the pot. I go for hard-boiled rather than soft, but this gizmo lets me do nice hard-boiled eggs without overcooking them, and further lets me start the batch with the eggs in cold water without worrying about corrections. Regarding cracking, my “oral” tradition is to add salt and vinegar to the boiling water — purportedly, the salt helps quickly coagulate leaks, while the vinegar makes the eggs easier to peel afterwards. Perhaps you have more information about these additions? OMG I LOVE EGGS !!!!!!!!!!!!!!!!!!!! easiest way to peel the egg i’ve found is to plunge the cooked egg (hard-boiled, as that’s the only way i like em) in ice water until it’s cold. crack the shell all over, then start peeling (i usually start at the big end where the air hole would be). the egg contracts and the shell pulls right off with minimal damage to the white. Very interesting. I’m definitely having trouble in the perfect soft boiled egg department. Armed with new info, it’s back to the kitchen for me. Might try this again with some ramen. 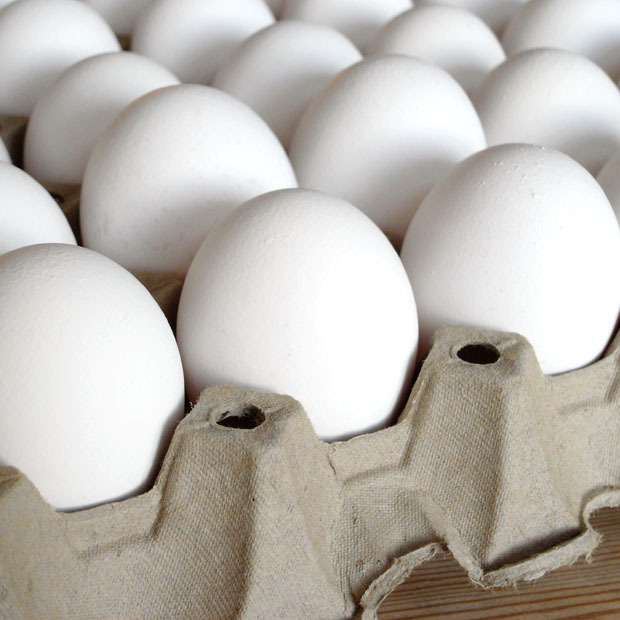 Great blog and great post about eggs. I wrote a post about Egg Graders (http://www.edibleusable.com/2009/03/useful-things-ill-never-use-acme-egg-grader.html) awhile ago and learned a lot about eggs that I never knew. I wonder how actual egg grade (freshness) affects the time they take to cook as well… I’ve taken it for fact that at least for poaching eggs, it’s best to use fresh, room temperature eggs – but I think that has more to do with the egg white holding together in the water. No mention of what were called “dropped eggs” in the MIT kitchen where the cooks were Jewish and the eggs were dropped into a large swirling vat of nearly boiling water and lifted out with slotted spoons as the whites coagulated. The yolks were appropriately runny and each egg stayed fairly intact. This was in 1942. When I try it at home with fairly large saucepan, it “almost” works, but I feel like it’s quite close, still need some training on scooping just right. This is a fascinating article. My wife can boil an egg to perfection I cannot. When we were serving eggs to order on Royal and Ministerial flights it was always a problem for the stewards to judge the exact time for a soft boiled egg with a cabin altitude of about 8,000ft. Their solution was a little easier than the mathematics displayed on this site. They put a pile of eggs into the boiling water (<100â°C of course). Then at intervals they kept taking one out and opening it until they got the correct result. The rest were then ready. I’m sure our scrambled eggs on the flight deck were made of the first underdone boiled ones but we didn’t mind. Just curious about the article. Thanks for posting. I thought it would be interesting to start researching on the subject. I would buy thermometers and lots of eggs. But I found this. “No mention of what were called “dropped eggs” in the MIT kitchen where the cooks were Jewish and the eggs were dropped into a large swirling vat of nearly boiling water and lifted out with slotted spoons as the whites coagulated. The yolks were appropriately runny and each egg stayed fairly intact. This was in 1942. This is the way Restaurants “do” Poached eggs in large quantities. Did you Acidulate the water – usually Lemon juice. With the yolk firming up before the white, I would suggest a two part cooking method (something I will try this weekend). Sous Vide the egg at 64.5 degrees for some period of time to let the entire egg cook through. This will produce a perfect yolk and an under cooked white. Remove the egg and refrigerate overnight. Then, the next day, take the refrigerated egg and place it in a sous vide of something slightly over 80 degrees (testing required here as my guess is around 82 or 84.) Leave it in the sous vide only long enough for the yolk/white boundary to reach 64.5. Remove, shock the shell with ice water for a moment to stop it from heating the egg further. Wait a minute or two for all the residual heat in the egg to stabilize and serve. This will allow the second heating to cook the white while using the refrigeration to insulate the perfectly cooked yolk from overcooking. Anyone with any thoughts or comments?